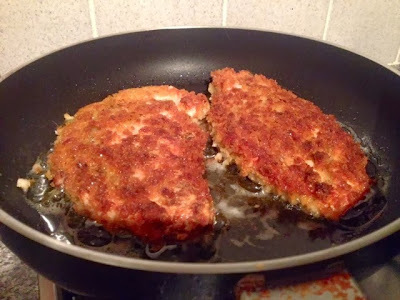 Is there anyone on this planet (apart from the vegetarians) who doesn’t love a nice bit of breaded fried chicken? I doubt it. This recipe is great for feeding fussy eaters and kids. It’s so simple to do and once you give it a go you’ll realise it’s really not worth bothering buying those frozen fillet things. These are much meatier and juicier and there’s the added bonus that there are only a few simple ingredients and you know exactly what’s gone into it. For an even more child friendly take on this, you could slice the chicken into goujons and follow exactly the same instructions to make chicken dippers. Also feel free to play around with the flavours. I’ve used smoked paprika here, but you could use whatever herbs and spices you have in your cupboard. Chilli flakes would give the dish a bit of a kick, or you could use some thyme or basil for a more herby flavour. Note the paprika doesn’t make this hot or spicy, just gives the chicken a mild smoky flavour. 1. 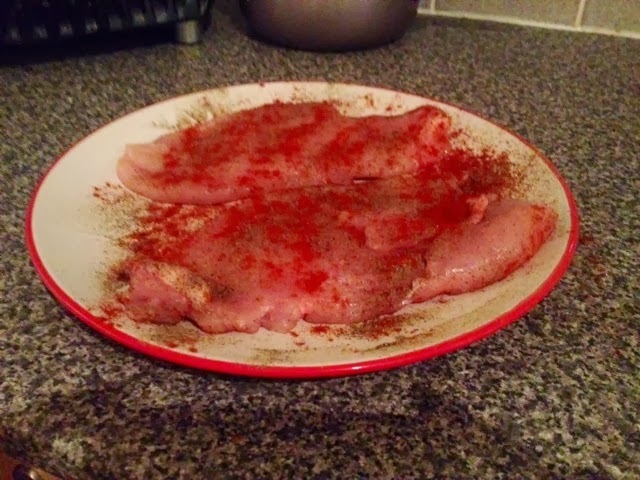 Place your chicken breasts, one at a time, between two layers of cling film. Bash vigorously (and evenly) with a rolling pin, flattening the chicken to approximately 1cm thick. 2. Coat with salt, pepper and paprika, making sure both sides are covered evenly. 3. Take three plates, on the first one spread out the flour, on the second, the beaten egg and on the third the breadcrumbs. Coat each breast in the flour, then dip in the egg and finally into the breadcrumbs, ensuring both sides are covered evenly. 4. With a large frying pan on a high heat, fill about 1cm deep with oil, gently bringing up the temperature until the oil is shimmering. 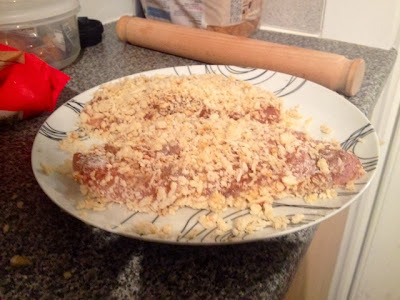 Test with a spare breadcrumb, the breadcrumb should begin to crisp up straight away when the oil is hot enough. 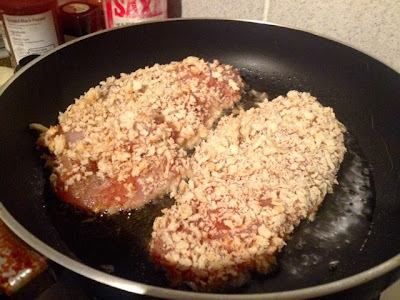 It is important the oil is hot before you place the chicken breasts in the pan because if you put them in too soon the breadcrumbs will just soak up all the oil before crisping up and go soggy. Gently lay the chicken breasts in the pan being careful of spitting oil. 5. After 5 minutes on one side, turn and fry for a further five minutes on the other side, the breadcrumbs should be crisp and golden. 6. Check the chicken is cooked through by slicing into the fattest part of one breast. 7. Dish up with veggies or salad. Crispy breaded chicken is also great in wraps so it may be a good idea to make extra for lunch the following day. Tip: a squeeze of lemon juice really helps to lift the flavour of the chicken. 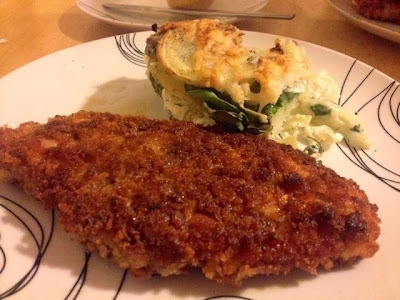 Crispy breaded chicken is served here with a Potato and Spinach Gratin. For a classic chicken and chips dinner, make your own Oven Baked Fries.